Have you ever been so eager to achieve something you would do anything to get there? Perhaps a goal was so important to you that you were in hot pursuit and vowed to do whatever it took to achieve the desired outcome. The normal process for setting goals requires identifying specific actions and behaviours that will enable us to achieve the goal. We commit to repeating these actions for as long as it will take as we know, if repeated often enough, they will steer us unerringly to the realization of those goals. Then something happens along the way and, more often than not, we abandon those goals and find comfort for doing so in some self-justifying reason. One of life’s inarguable truths is this: when something is important, we will always find a way to make it happen and when it isn’t, we will find an excuse for not doing so. And as we all know, for most of us, finding an excuse seldom requires a lengthy search. Of course, there are as many reasons for not achieving goals as there are people who set them. Over the years I have coached thousands of clients, and without doubt, the primary cause of not achieving goals is very simple: we are not doing the right things, often enough. As a coach, I ask clients to seriously think about and then list all the things they will be required to do to achieve their human goals. As you can imagine, the lists are often quite lengthy, filled with tasks to be completed and actions to be repeated. Much of their time is spent on these actions, yet, the expected results rarely show up. Rule #1. Results don’t come from being busy, results come from what we are busy with. In other words, it’s not that we are working hard, it is what we are doing while working hard. 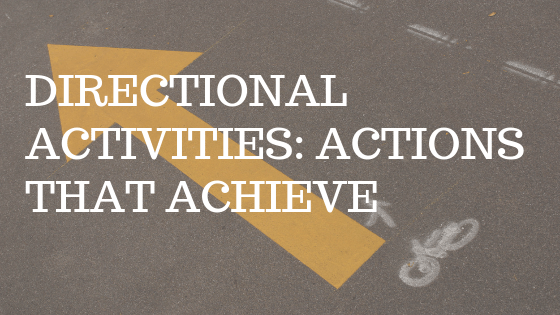 Many years ago, I coined the phrase “Directional Activities.” Directional Activities are those actions we must do repeatedly that, each time we do them, we move a teeny bit closer to our goals. These activities continuously move us in the direction of our goals. And there are very few of them. So few that I can count on the fingers of one hand the number of times I have worked with a client whose goals had more than three truly directional activities each. And, after counting, I would have a few fingers left over. That’s not to say every other action on their list is unimportant. Those actions are often extremely important to the attainment of their goals, but, by themselves, they are supportive of our Directional Activities and do not move them any closer to reaching their goals. Our Directional Activities are often the very actions we are least comfortable doing and the temptation of spending our time on important, and more comfortable, activities is powerfully enticing. Rule #2. If we do not do our Directional Activities on an ongoing, repeated basis, it won’t matter how well we do the important ones. We will never achieve our goals. Remember, if we aren’t constantly moving closer towards our goals, we are probably moving further away from them. And that is not the direction in which we want to be heading.